How Significant Are the Persuasive Sentence Starters? 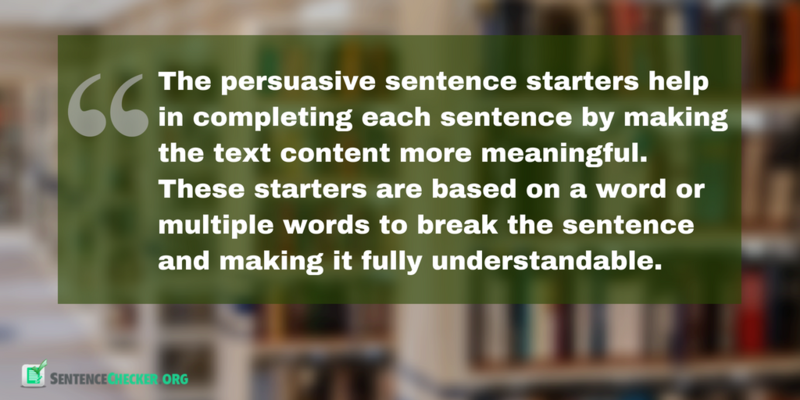 The persuasive sentence starters help in completing each sentence by making the text content more meaningful. These starters are based on a word or multiple words to break the sentence and making it fully understandable. Although, a reliable sentence checker can be used for correction but the manual review is necessary as well. In short, the sentence starters are supposed to elaborate the text in the proper manner. 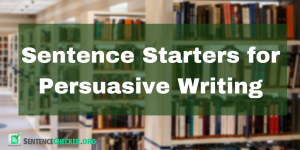 Sentence Starters for Persuasive Writing: Why We Need Them? The use of comma in the end of a persuasive sentence starter makes every sentence quite simple to understand. This opening statement is helpful to turn the sentence more appealing and grab the focus of readers. Clarity of the whole story, essay or anything you write is possible once you use these starting phrases or single words to begin every sentence to show relationships (between the two parts of a sentence). If you are not familiar with persuasive writing or the use of persuasive starting statements, you need to collect some experts recommendations then. First of all, you have to study about making the opening of sentence more eye-grabbing. Then, do some practice and begin to apply certain techniques as well. The attractive start is one of the best tricks to persuade the readers more towards your writing pieces. Writing not-so-appealing lines is a mistake. Make sure that you create an attention-grabbing statement in the beginning of the sentence. Use of other punctuation symbols. The persuasive sentence starters are only ended with the comma. Writing the longer opening statements. Try to end up your sentence starter in just 5 to 6 words. Repetition of the persuasive sentence starters. It is another mistake that needs to be ignored for sure. “I picked this quote because”: The wrong start as writing in the first person isn’t acceptable. “This quote from ABC News says”: Never mention the name of any source to discuss about information. ““Adam John” says how”: The name of any specific person is not allowed to discuss. “In this situation, it proves”: There can be one point instead of the two. “As you can see”: No one knows what has been written until the last line. Stop making assumptions. “This quote proves”: It is a conventional line that needs some rephrasing. Make some useful changes in it. “According to the research by XYZ journal”: It is better to make some amendments in the line by changing the word according. “I reached the final verdict that is”: You can analyse the mistakes in this sentence. It’s filling up the line and seems unnecessary. “In my point of view”: You are not supposed to share personal views in the academic drafts. “You can analyze”: Never write such sentences as all the readers don’t have similar minds to think what you want them to. Let’s browse a trusted page to learn quintessential tips of writing persuasive content. You’re actually going to get the feasible info about composing the text content in appropriate manner!